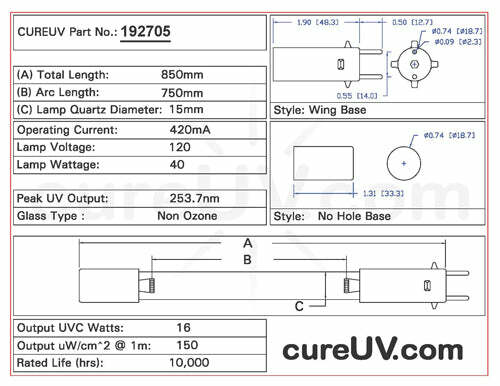 The UVC light bulb works well for germicidal OEM water filters, UV purifiers, and UV sterilizers. Research states that UVC light technology is effective against bacteria, molds, viruses, yeast and protozoa. The light bulb gives you twelve months of tension-free working after which we recommend that you replace the light bulb even if it emits light. After the designed period of time, the light bulb loses its germ killing ability. Many people believe that UV water purification provides a safe solution. It is known that this method of sterilization is basically a physical process. It does not alter the pH, chemistry or taste of water. The UVC purification method is both economic and environmental friendly and is a much better option to chemicals and their bi-products. It helps in providing a safe solution against microorganisms such as giardia and cryptosporidium, which are resistant to chlorine disinfection. The UV lamps emit wavelength energy of 253.7 nm and this energy reacts with the genetics of the microorganisms.